The ornery Burdock Brown was an Elder of Een. In his youth, he was a friend of Kendra Kandlestar’s Uncle Griffinskitch, but hostility developed between the two wizards over the years. Burdock Brown professed a profound hatred for Kendra’s mother, Kayla Kandlestar, which may be one of the reasons why he disliked Kendra so much. Burdock was a hunched and ugly Een, with a long nose and a single fuzzy black eyebrow that skittered across his forehead like a caterpillar. 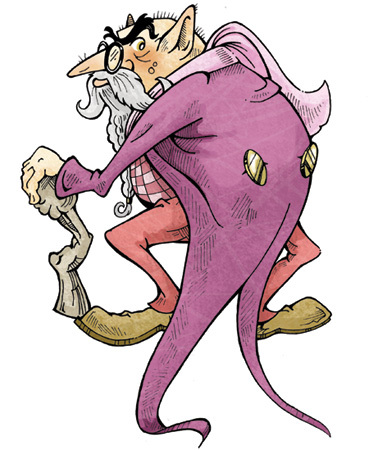 Like all Een wizards, Burdock carried a staff of Eenwood, but he shunned the traditional humble robes and capes for brightly-colored attire. When Winter Woodsong became too ill to continue as head of the Council of Elders, Burdock assumed her place. He relished in his new found power, creating many rules and regulations to govern the Land of Een. Eventually, he declared himself Emperor of all of Eendom, turning into a true tyrant. In particular, Burdock enacted many new laws to punish Een animals. Burdock had always harbored a deep mistrust of Een animals and he considered these “critters” to be wild things, unworthy to live in the Land of Een. Ultimately, Burdock showed scant concern for Een. He did not even react when informed that an army of monsters was marching towards the magic curtain, with the intention of destroying Een. As the battle for Een unfolded, Burdock conveniently disappeared, biding his time in the shadows while the rest of his compatriots fought valiantly for their home.